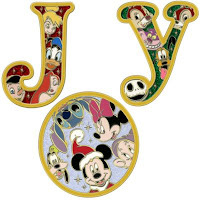 Coming soon to DisneyStore.com - the Jumbo Holiday Joy 3 Pin Set. This will be a LE 100 set and release date is anyone's guess. The pin features glitter accents to each pin, along with characters like Jack, Mickey Mouse, Stitch, Tinker Bell, Goofy, Dopey and Jessica Rabbit.